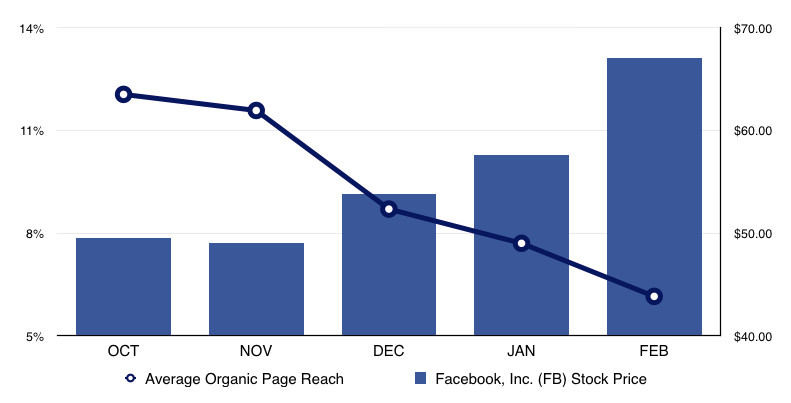 Facebook organic reach for business pages is plummeting, and will drop even further because Facebook is a public company that has fiduciary responsibilities to their shareholders to maximize returns. This chart we made shows Facebook’s declining organic reach (according to a widely cited study from Social@Ogilvy) charted against Facebook’s stock price during the same period. 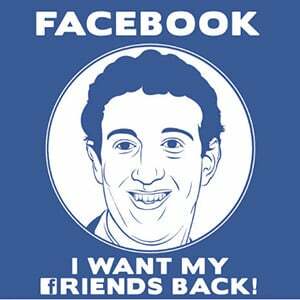 As organic reach dropped from approximately 12% to 6% (and now often at 1%), Facebook’s stock price moved from nearly $50 to nearly $70, adding billions of dollars in market capitalization. Yes, Facebook encouraged businesses to build and reach audiences for “free” on their platform (until that free ride ended), and that should be no surprise whatsoever. Clear-eyed business observers have been raising the alarm about building your house on rented land for years, but Facebook has still been able to pull off the greatest Gillette scam ever (you give away the razor, and then sell the blades). Let’s remember that Facebook OWNS Instagram, and if you think they aren’t going to eventually pull the EXACT same move on Instagram you are naive. Google + is looking better and better, right? How much is that engagement really worth to your business? The side benefit of this Reachpocalypse is that it may force more social media people to really study the impact of social on business outcomes. Great job by Chris Penn from Shift putting together this handy “what will Facebook cost me?” tool. It’s not as though it’s now IMPOSSIBLE to be good at Facebook. It’s just a lot, lot harder. If you want free reach, you need to do extraordinary, useful things. Every week we document an amazing social media case study here on the blog, and another one in the Social Pros podcast in the “Holy Social!” segment. There are great ideas in there. You can’t fully replace your corporate Facebook program with this approach, but with reach evaporating for business pages, aren’t your employees and current customers and advocates now the very best way for you to distribute your message on Facebook? I delivered a presentation about this at the recent Social Media Marketing World conference, and I’ll be writing a blog post about it (possibly with an accompanying BlogShare) that provides details and how-tos. So what’s your plan? Are you going to abandon ship, or work harder and smarter? Either way, why don’t we stop bitching about Facebook, realize that they snookered the business community, and get back to work?